SAGE publishes the work of leading minds in groundbreaking textbooks, influential journals, and must-have reference materials across the social science curriculum. Known for our exceptional, high-quality content and innovative resources, instr­­­uctors, students, and professionals alike trust us to provide the study and reference tools they need to succeed in both academic and professional environments. Bookmark this page and visit us again as we profile new books and highlight the latest research in our journals. 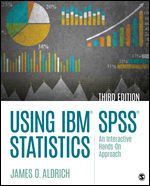 Using IBM® SPSS® Statistics: An Interactive Hands-On Approach, Third Edition gives readers an accessible and comprehensive guide to walking through SPSS®, providing them with step-by-step knowledge for effectively analyzing their data. From entering data to working with existing databases, and working with the help menu through performing factor analysis, Using IBM® SPSS® Statistics covers every aspect of SPSS® from introductory through intermediate statistics. 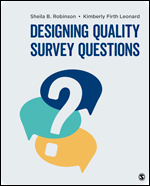 Designing Quality Survey Questions shows readers how to craft high quality, precisely-worded survey questions that will elicit rich, nuanced, and ultimately useful data to help answer their research or evaluation questions. The authors address challenges such as language preferences for standard demographic questions (e.g. How to ask about gender), creative question design to keep respondents engaged and avoid survey fatigue, web-based survey formats, culturally-responsive survey design, and factors that influence survey responses (memory, social desirability, etc.). Zina O'Leary's Research Proposal Little Quick Fix gives students a clever, beautiful workbook packed with real-life examples to keep them on track. 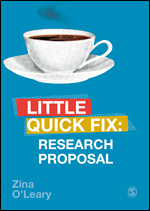 Use it to: work through guided exercises; understand the elements of the proposal; and, put them together thoughtfully to create your own research proposal—fast.